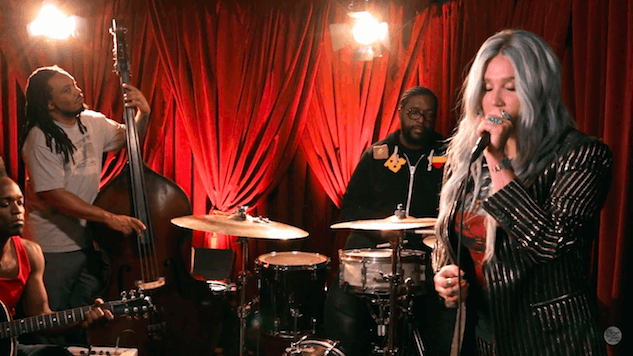 Watch Kesha and The Roots Cover "House of the Rising Sun"
During her time on the Late Night with Jimmy Fallon set last week, Kesha recorded a sultry cover of “The House of the Rising Sun” with The Roots, which is something we never knew we needed but are more than happy to receive. The song is suited for her voice, which has been much more prominent in her latest work. Just last week, Kesha released Rainbow, a soul-baring album that marks her liberation from her legal battle with Dr. Luke. To celebrate, she performed on Late Night on the date of the album release and also released a music video for “Rainbow,” a track about self-love. Watch Kesha and The Roots cover The Animals’ track above.